In Cartagena de Indias, the coastline is covered by modern condominiums that reach to the sky. One place, however, brings back the charm of days gone by. In this walled city known as a UNESCO World Heritage Site, the streets are paved with cobblestones and lone vendors walk them selling their wares. It will truly take you back to a simpler and actually more luxurious time. Between the 16th and 18th century, this area of Columbia was inhabited by the Spanish. Monks and middle class workers were building homes and setting up residence in the area. The styling of this time has been preserved through city codes that dictate the way homes and buildings must look. The historic district is one of the most sought after areas for people looking to purchase property in Columbia due to its old world charm and antique look that draws many to the place year after year. There is one home in particular, which is known as the Casa del Hobo, that has the look and feel of a time when the Spanish ruled. Listed on the market for $2.6 million, this home is located just moments from some of the most popular attractions in Cartagena de Indias. The Santa Clara Monastery, a popular tourist attraction, is within walking distance of the dwelling. Now a hotel called the Plaza San Diego, this former convent used to house some of the monks that lived in the area. There is also a wide range of old time eateries and charming stores near the property. The home was practically in ruins when the new owners purchased the property, but they had a vision to bring it back to its former glory and create something straight out of old-world Columbia. Starting at the first floor, they left one side of the dwelling open to create a courtyard. This part of the house also includes an elegant dining area and a modern kitchen. Near the coral wall is a pool where the residents of the home can enjoy the tropical weather. The home also includes two more stories that feature four bedrooms, a bathroom and a hot tub that overlooks the ocean. In this city, homes can be priced for as much as $6,000 per square foot, and even at this price, many of the dwellings still require extensive renovations. 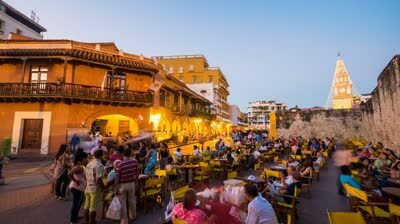 Cartagena de Indias has become one of the most popular sites for those who want to live abroad. Some people turn these run down homes into quaint shops, while others choose to renovate the home for use as a vacation destination. In fact, towns in surrounding areas have started to create similar small cities for new buyers. Many companies like Kit Capital, are investing in these areas. This area is truly the place for anyone who wants a little piece of the Caribbean in Columbia.